In Jolly LLB 2, Akshay Kumar subdues his muscle power and makes for a good dramatic turn as the lawyer on a right path. The comedy lies in the local language and the conversation between Annu Kapoor (the crooked prosecutor) and Saurabh Shukla (the judge). Worth a watch! And with the presence of Akshay, it is a masala entertainer. Films demand good researches when they are based on the theme of corruption in Indian judiciary, and Jolly LLB 2 scores well on this front. Watch this if you are in the mood for a legal drama, albeit a long, arduous one. 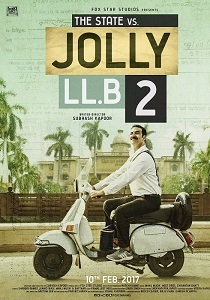 Jolly LLB 2' had all the potential to become a jolly good film, but ends up being a mildly good type of product. It will be loved by all those who have not seen 'Jolly LLB' and for the ones who have, might end up watching this movie as a strictly one time watch. Hina, who is expecting the child of her deceased husband, commits suicide when she realises that not only has she been fleeced but also that her case will never reach the court. Performance-wise, kudos to Akshay Kumar for once again backing a content-driven film. Kumar is one of the very few actors who have the ability to let his presence in a film be eclipsed by rich content. If the film focused on the crime, without trying too hard to make it easy-breezy and crack jokes that don’t have much context to the film, it would have made for a far more compelling story. Akshay Kumar's stint as a lawyer is jolly good! The verdict, in this case, isn’t in Jolly’s favour.